As we know that New Year and Christmas are round the corner so we must think of some activities to engage the kids and let them make some fun and easy crafts for the fest ivies. Christmas and New Year are on time of the whole year when we really look forward to enjoy to our fullest with some cool crafts, delicious food and well decorated house. This time of the year is more special than any other time so we must do some really great and special stuff for this time of the season along with our kids and family. Here you will find some crazy hat making ideas for the New Year’s Eve that you can try and enjoy this New Year more than ever with these cool and amazing hats. Most of the kids are interested in the creative activities but you must let them know the ideas according to their own interest and choices. Make them watch these incredible ideas along with the tutorials and start these projects with them right away. The first project that we have here are Christmas party hats painted with cool Christmas colors. Try different patterns such as stripes, polka dots, spirals and much more that you can try. 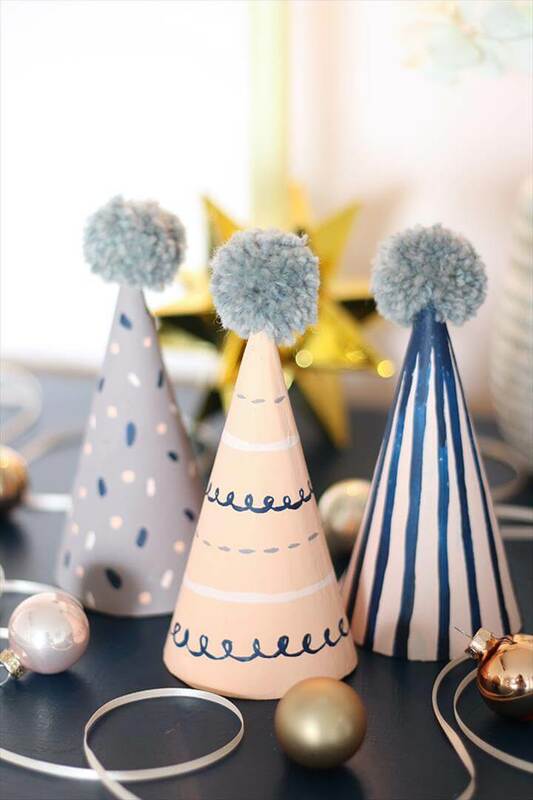 Grab some basic crafts and supplies that are required to make such hats for Christmas and New Year. All you need to have are paints, brushes, card boards for making hats, glitter and much more to add spark to these projects. Also you can follow a theme while making these hats such as a cartoon theme or another. Besides this pom pom can also be used for such decorative hats for New Year’s Eve. Share these 10 New Year’s Eve Hat Activities For Kid’s amazing ideas with other too so that they can also get their children engaged in activities like these. You can find the relevant tutorials for each project in the links given below these projects.